One of the telltale signs of a Rolex is the Cyclops lens over the date aperture. Termed as a “Cyclops” window because of its large one-eye appearance, the Cyclops is pure Rolex from both a design and functional standpoint. Like with many Rolex designs, there are few other companies who use the technology the same way Rolex does. The Cyclops refers to a lens that is above the date aperture on all but two Rolex watches that possess a date. The Cyclops rests above the crystal providing 2.5x magnification to assist with reading the date. Hans Wilsdorf added a magnification Cyclops window because his near-sighted wife could not read the date on her watch. The Cyclops was introduced on the DateJust at the 1954 Basel watch fair. Turn-O-Graph also sported a date Cyclops introduced the same year, and the GMT Master was the first sport Rolex to have a Cyclops over the date aperture. 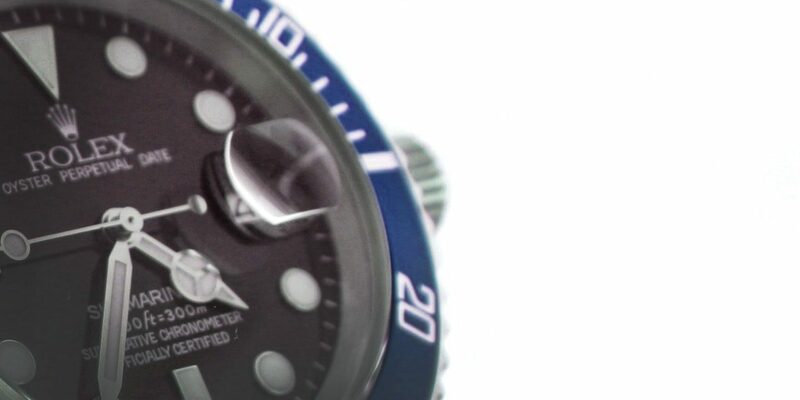 The only two watches that possess a date but without a Cyclops is the DeepSea Sea Dweller, and the original Sea Dweller. The crystal thickness on both those watches is thicker than the standard Rolex crystal. A Cyclops on a thicker crystal would not read correctly, and in the case of the DeepSea, would not work at all because of the domed shaped crystal. What makes the Rolex Cyclops a trademark feature is that it sticks up above the crystal. For many watch brands, a Cyclops would blend in, but for Rolex it is a standout feature. Unlike many other watch brands, Rolex does not apply any anti-reflective coating to its crystals, and one of the reasons why Rolex crystals glitter more that other watch brands (in addition to being the high quality crystal made in Rolex’s factory). With a shiny, reflective crystal, a Cyclops sticking up stands out more than if placed on a crystal with anti-reflective coating. This is one of the distinguishing visual features that make Rolex stand out. Starting in 2005 with the introduction of the updated GMT Master II, Rolex started applying antireflective coating on the underside of the crystal where the Cyclops rests making it easier to read. Rolex watches updated from 2005 forward now have anti-reflective coating as part of the Cyclops. The anti-reflective coating makes a night-and-day difference when reading the date. Some Rolex wearers do not like the Cyclops preferring a flat crystal like the ones found on most other watches. Many do not realize that with sapphire crystals, the Cyclops is glued to the crystal. Removing the Cyclops takes some skill, guts, and a sharp razor blade. With the older Rolex sapphire crystals, removing a Cyclops makes the crystal a flat disk. With the newer models since 2005, the anti-reflective coating on the underside shows. Needless to say, the vintage acrylic crystals cannot have the Cyclops removed as the lens is integral to the crystal. Without question, see a Cyclops, most likely it’s a Rolex.